Sulla peste di Costantinopoli del MDCCCIII. Mantova, presso la Societ? tipografica dell?Apollo, 1805, 8vo cartonato originale leggero muto (strappi e mancanze al dorso) pp. 7-310-(2) copia ben marginosa con barbe (ma con abrasione e gora che prende una piccola parte del margine bianco esterno, ma non incide mai sul testo a stampa). Exlibris Loris Premuda all?interno della copertina anteriore. L?autore spiega il mezzo dell'inoculazione per domare il contagio della peste che aveva conosciuto in Oriente. Sulla sua stessa persona oper? l'esperimento attraverso l'inoculazione del "miasma" pestilenziale. Beschreibung des Vorgebirgs der guten Hoffnung nach seinem ehemaligen und jetzigen Zustande, in historischer, geographischer, topographischer, statistischer und kommerzieller Hinsicht. +++ Beigebunden: Robert Semple's Schilderungen von dem Vorgebirge der guten Hoffnung und Spaziergänge und kleine Reisen auf demselben. Aus dem Englischen. Mit einigen Anmerkungen herausgegeben von Theophil Friedrich Ehrmann. (2 in 1 Bde). Mrs. MEANWELL'S LAST LEGACY to the Rising Generation. pages, including the pastedowns to the wrappers. pages being letterpress, and  comprising pictorial title and ffiteen pages of engravings, two images per page. Original marbled wrappers. 12mo. Covers rubbed; else an excellent copy of this outstandingly well produced juvenile, boasting engravings of great charm and quality. Contains an engraving of a Kangaroo, with a description. Rare. OCLC records one copy only at Princeton. Vierländerin in Witwentracht (Festgewand mit Trauerschürze), zu beiden Seiten ein Junge und ein Mädchen in vierländer Tracht. 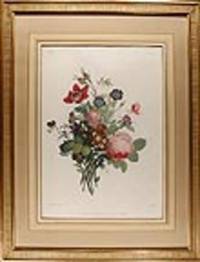 Aquarellierte Original-Federzeichnung von Christopher Suhr (1771-1842}, unten links im Bild signiert. London: Richard Phillips, 1805. 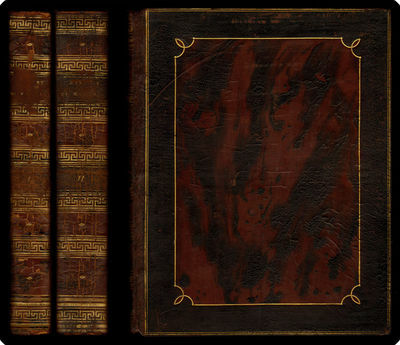 Three volumes, duodecimo, bound together in attractive contemporary tree calf, spine gilt with crimson label, a fine copy. Historically significant account of trading between New South Wales ports and the greater Pacific.Turnbull's book was the first serious account of commerce and trade originating from New South Wales. It was an influential book in promoting the idea of Australia as a venue for commercial success. 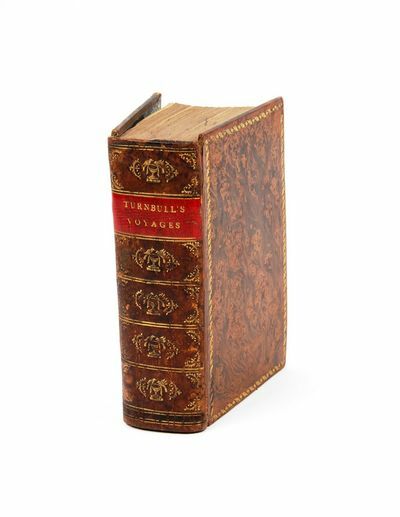 A second edition was published eight years later as a single large volume.Turnbull and his partner Byers, envious of the profits being made by American traders, fitted out the Margaret for a speculative trading venture. They arrived in Sydney from the Cape of Good Hope in February 1801, and Turnbull gives a long description of the town, and the trading activities and agricultural prospects of the colony. They made similar stays in Tahiti and Hawaii (where they learned of Kamehameha's planned invasion of Kauai). Turnbull set up a business in Tahiti curing hogs with salt obtained in Hawaii. He is also remembered for the discovery of three islands in the Tuamotus. dalla Stamperia Righetti,, In Salò, 1805 - In-8° (cm. 20,6), legatura successiva in m. tela con titolo in oro al dorso (usure), tagli superiore e inferiore a spruzzo; pp. XVI 332 [4 bb.] in ottimo stato, qualche sporadica macchia. Edizione originale veramente rara e interessante della monografia sulle due valli bresciane. In fine vi sono alcune antiche iscrizioni lapidee. Cfr. Lichtenthal 211; Lozzi 5786n. Buon esemplare. 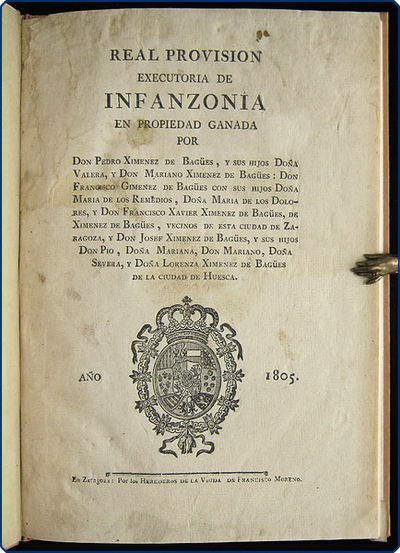 Real provision executoria de infanzonía en propiedad ganada por Don Pedro Ximenez de Bagües, y sus hijos Doña Valera, y Don Mariano Ximenez de Bagües: Don Francisco Gimenez de Bagües con sus hijos Doña Maria de los Remedios, Doña Maria de los Dolores, y Don Francisco Xavier Ximenez de Bagües, de Ximenez de Bagües, vecinos de esta ciudad de Zaragoza, y Don Josef Ximenez de Bagües, y sus hijos Don Pio, Doña Mariana, Don Mariano, Doña Severa, y Doña Lorenza Ximenez de Bagües de la ciudad de Huesca. Zaragoza: Herederos de la Viuda de Francisco Moreno Folio (29.4 cm; 11.625"). ff., 4 plt.. 1805 This patent of nobility ("Real Provision Executoria de Infanzonía") outlines the history of the Ximenez de Bagües family and the meaning of their assigned coat of arms. Three pages contain an "Arbol Genealogico" starting in 1596 with Don Miguel Ximenez de Bagües; two of these pages are => hand-colored with black and green ink to form leafy branches connecting members of the family tree. Printed patents of nobility are unusual as the documents were normally created as an ornate manuscript using multiple colors. Searches of the CCPB show 16 examples of printed patents of nobility and the Spanish National Library claims only one; WorldCat lists only one example held in the United States. => None of these examples describe the Ximenez de Bagües family. The final leaf is a => full-page copperplate engraving of the Don Pedro Ximenez de Bagües coat of arms in sepia ink, surmounted by a helm and banners, supported by putti, and surrounded with military impedimenta including spears, a club, a bugle, a shield, a drum, cannonballs, and a cuirass. The plate is signed "Js. Dordal" for José Dordal (1780–1808), a Zaragosan engraver known for his portraits, including one of Ramon Pignatelli. Later tan buckram with light soiling on covers and spots of discoloration; small amount of pencilling on endpapers. Gentle age-toning, light marginal waterstaining, and some creasing; two small wormholes in top margin of title-page, same leaf with a sliver of upper gutter margin lost and the next with that portion folded down in binding; a handful of very small pinpricks on outer edge of plate. => A visually engaging example of an unusual, PRINTED patent of nobility. Plan de la Ville de Vienne et de ses Fauxbourgs. Wien Artaria um 1805 - Kupferstichkarte von Jean Spiegel, Rundplan Durchmesser 51,5 cm, Blattgr. 53 x 64 cm. Dörflinger, Österreichische Karten des frühen 19. Jahrhunderts, p 364 (Art 46). Dekorativer Plan von Wien zwischen Fertigstellung des Wiener-Neustädter-Kanals und der Demolierung der Burgbastei durch die Franzosen 1809 erschienen, in einer etwas ungewöhnlichen kreisrunden Form, zeigt im Prinzip das Geniet innerhalb des Linienwalls; am oberen Bildrand Titel beschnitten, unten knapprandig. Biblia, das ist: die ganze Göttliche Heilige Schrift Alten und Neuen Testaments, nach der Deutchen uebersetzung D. Martin Luthers. 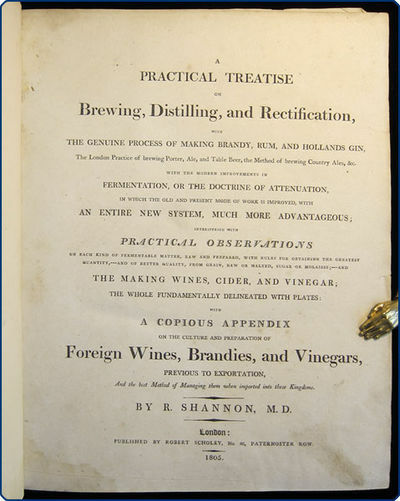 A practical treatise on brewing, distilling, and rectification, with the genuine process of making brandy, rum, and Hollands gin, the London practice of brewing porter, ale, and table beer, the method of brewing country ales, &c.
London: Robert Scholey 4to (27.5 cm, 10.9"). xxxii (half-title lacking), 307, , 248, 135, , 183,  pp. ; 8 plts. (1 fold. ), 5 fold. tables.. 1805 Without a doubt, this is one of the most prominent English works on brewing and vinting of its time, present here in its first editon. Shannon, a physician whose first name is given as Robert by some sources and Richard by others, promotes a scientific approach to utilizing chemistry and methodical processes rather than guesswork or tradition; each section of his exhaustive treatment of the subject provides not only definitions, recipes, and instructions for all sorts of eventualities, but also comprehensive lists of varieties of beer, wine, and other spirits from different regions — so that Kingston ale, Brunswick Mum, spruce-beer, red ratafia, lemon wine, and vino tinto, as well as various cordials, essential oils, bitters, vinegars, and distilled waters, are present here alongside porter, Holland gin, cider, mead, sherry, etc. The author also gives histories of some of the primary types of spirits and liquors, along with details of viniculture, transportation of materials and products, etc. Gabler (Words into Wine) notes that while most writers consider Alexander Henderson's the first detailed account in English of modern wines, Shannon's work => predates Henderson's by 19 years. The volume opens with a list of the subscribers; each book has a separate title-page; and the text is enhanced with => eight engraved plates depicting equipment and five folding charts of various measurements and benchmarks. There are several pencilled annotations present in the margins, indicating practical and analytical-minded engagement with the text. 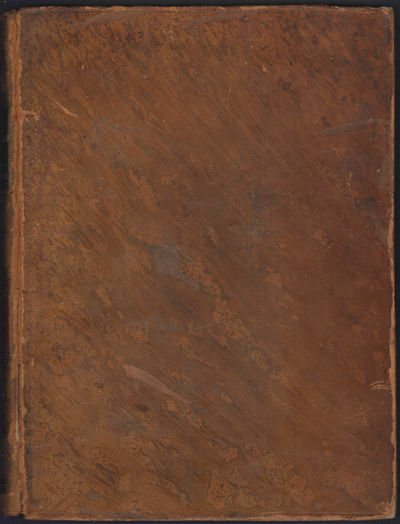 Provenance: Front free endpaper with inked ownership inscription of the Hon. Henry Frederick Francis Adair Barrington, a South African lawyer, politician, and farmer; the inscription is dated 1877, five years before his death. 19th-century half navy straight-grain morocco with marbled paper–covered sides, edges speckled brown, and spine with gilt-stamped title and gilt-ruled raised bands; rubbed at joints, sides, and board edges with front turn-in slightly pulled at head. Half-title lacking, leaf z1 in the appendix apparently a cancel, title-page with small edge nick, inked inscription and pencilled annotations as above with some final words of notes partially shaved. Some leaves, plates, and sections variously with creasing, foxing, corners bumped, or light to moderate waterstaining; perhaps three short tears; none of this frightful and the volume quite sound. Front pastedown with small ticket of a London bookseller. An important treatise designed to be used as a reference work and a copy of it that was used so. A northern summer; or travels round the Baltic, through Denmark, Sweden, Russia, Prussia, and part of Germany in the year 1804. Gillit für Richard Philipps, London 1805 - Die getönten Aquatinta-Kupfer zeigen u. a.: Copenhagen, Stockholm, Upsala, Petersburg, Narva, Berlin: "Brandenbourg Gate" (Brandenburger Tor).Halbleder der Zeit, fachgerecht neu aufgebunden, so daß der Charakter des Buches erhalten geblieben ist, siehe Foto. Mit 11 getönten Aquatintataf. XII,480 S., 2 Bl.w. Malerische Reise durch einen grossen Theil der Schweiz vor und nach der Revolution. Edinburgh Constable & Co 1805. G+ : in Good condition plus. Rebound with new eps. Frontis map with tape reinforcement. Two small holes to page 219, one in the margin. Some minor marginal worming [defunct] on lower corner with no impact on text [First Edition] Modern marbled board quarter calf 280mm x 220mm (11" x 9"). 509pp. Folding map and 10 [of 11] plates. Die Westliche Halbkugel nach den zuverlässigsten und neuesten Nachrichten entworfen und nach A. Arrowsmiths Weltkarte heraus gegeben Nürnberg in der Kayserlichen privilegirten Kunst und Buchhandlung bey Ad. Gottl. Schneider und Weigel 1805. Nürnberg 1805 - Copper engraving, handcolored in outline and wash when published. In very good condition. Inner Oesterreich oder Die Herzogthümer Steyermark, Kaernten und Krain. Die Grafschaften Goerz und Monfalcone. Die Bezirke Triest und Istrien. Nebst den angränzenden Theilen von Italien, Tyrol, Salzburg, Nieder Oesterreich, Kroatien und Hungarn. Nach den neuesten topographischen und geographischen Hülfsmitteln gezeichnet von H. C. Zürner Ing. Geog. - L&#145;Autriche Interieure, ou Carte de la Stirie, de la Carinthie & de la Carniole [.]. Bonn: N. Simrock [PN] 422. [ca. 1805]. Oblong and upright folio. Disbound. Piano part: 1f. (title),  (blank), 4-35, [i] (blank) pp. Engraved. Price: "6 Fr." Annotations to title page in French in faint red crayon, partly illegible: "44 planch[es] Simphonie même [?]retourner." Violin part: 12 pp. Piano part extensively marked up for re-engraving in an unknown hand, occasionally in ink ("Commencer planche 2" and "Beethoven, op. 47" at head of p. 4); annotations to title in faint red crayon, partially illegible: "44 planch[es] Simphonie même [? ]retourner;" additional annotations in red crayon and pencil; pagination amended to exclude blanks; references at page ends with custos function ("V.S. ", "V. Var. 1," etc.) deleted; system rebreaks indicated; numerous errors in notation corrected; fingerings added (apparently in another hand, not for re-engraving). Violin part from another copy. . First Edition, later issue with corrections to title consisting of "uno stile" instead of "uno stilo" in the 3rd line and the insertion of "per" before the composer's name. Kinsky p. 111. Dorfmüller plates 2 und 3. Hoboken 2, 228 (violin part could also be 227). The piano part of the present copy evidently served as a Stichvorlage for a later edition that remains to be identified. The French directives would suggest a French publisher, or at least a French engraver; the system rebreaks imply that the new edition was no longer to be in oblong format. Jacob Lateiner's catalogue card claims: "This copy used by Farrenc to publish his own edition." No edition of op. 47 by Farrenc has, however, been traced. 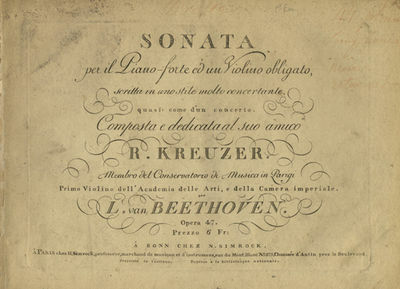 Beethoven completed the Kreutzer Sonata in 1803. He had intended to dedicate it to the violinist George P. Bridgetower (1778-1860), for whom he wrote the work and who gave its first performance. Beethoven changed his mind and dedicated it to the French violin virtuoso and composer Rodolphe Kreutzer (1766-1831), "who had made a very favourable first impression on him. Ironically, Kreutzer then refused the play the sonata, which he reportedly found 'outrageously unintelligible.' " Kaplan: The Cambridge Companion to Beethoven, p. 138. Bridgetower, an English violinist, was the son of a West Indian father and a European mother. "He appeared at court in Windsor, and at concerts in Bath and Bristol, before making his London début at the Drury Lane Theatre oratorio on 19 February 1790. His concerto performances here attracted the notice of the Prince of Wales (later King George IV)... During the next decade he played at many prestigious London concerts, appearing alongside Haydn at Salomon's series... It was through Prince Lichnowsky that Bridgetower met Beethoven in the spring of 1803 and that their famous concert (in the Augarten, 0n 24 May) was financed... There is no question that Beethoven, who spoke highly of Bridgetower both as a soloist and as a quartet player, intended to dedicate this sonata to the young violinist... But the two men later fell out of favour with one another, allegedly after a quarrel over a girl..." George Grove in Grove online "The virtuosity and scale of this famous sonata proclaim it even more decidedly a middle-period work. In composing it in, as the original title-page says, 'a very concertante style, almost like a concerto', Beethoven transferred the violin sonata from the private salon to the concert hall (at a time when public concerts were becoming established in Vienna) and did for the medium what the 'Razumovsky' Quartets did for the string quartet and the 'Waldstein' and 'Appassionata' Sonatas for the piano sonata." Arnold and Fortune: The Beethoven Reader, p. 220. A particularly interesting copy. Boisgelin de Kerdu, Pierre Marie Louis de. Ancient and modern Malta: Containing a full and accurate account of the present state of the islands of Malta and Goza, the history of the knights of St. John of Jerusalem, also a narrative of the events which attended the capture of these islands by the French, and their conquest by the English: and an appendix, containing authentic state-papers and other documents. London: Richard Phillips 4to (27.5 cm, 10.75"). 2 vols. I: , xlviii, 326 pp. ; 2 fold. plts., 3 fold. tables, 17 plts. (fold. map & 1 prelim. f. lacking). II: , vi, xxxi, , 258, , 315, [9 (index)] pp. 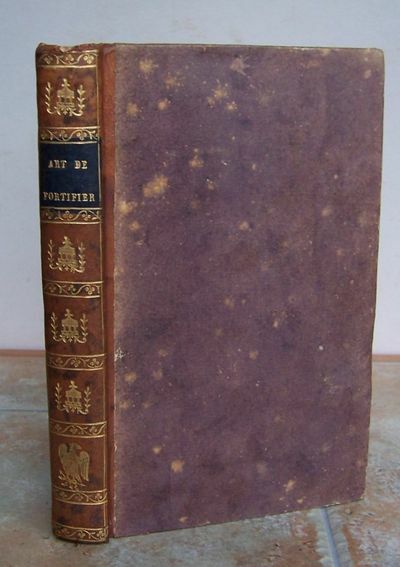 ; 5 plts.. 1805 Second edition, following the first of 1804–05. The author, who was himself a Knight of St. John, here covers the culture, language, economy, natural history, and costume of the Maltese — as well as describing the Bichon or Maltese dog (also rendered pictorially in one of the plates) — before moving on to the history of the Hospitallers from the 16th century onwards. Vol. I includes catalogues of scientific names of the plants and fish of the area as according to various authors, and is illustrated with an => oversized, folding detailed view of the city and port of Malta (with an accompanying folding chart identifying the major landmarks of that view); at the back of that volume there are also two folding tables accounting for treasury expenses of the Order of St. John of Jerusalem. Vol. II features a view of Messina, along with several portraits. In total, the work is illustrated with => 24 copper-engraved plates, some aquatint, done by Merigot and others. 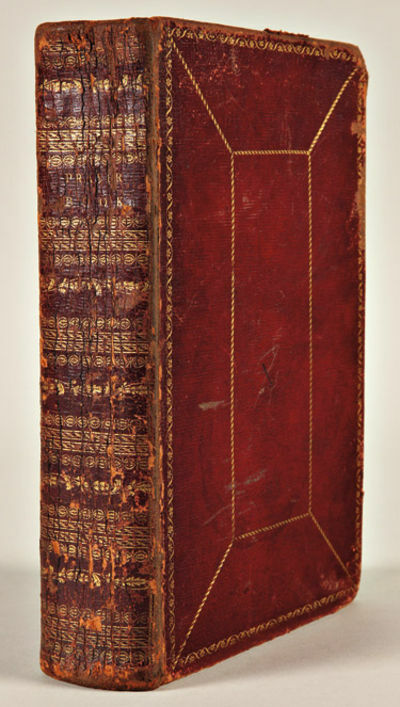 Binding: Contemporary stained calf, panelled in dramatically mottled calf with inlaid corner fleurons, framed in gilt double fillets; spine with gilt-stamped title and gilt-stamped Greek key bands. Bound as above with leather expectably acid-pitted, scuffing with small cracks and spine titles partially rubbed away; joints (outside) expertly repaired. Folding map and one preliminary leaf (the list of plates) lacking in vol. I and that volume with a light old waterstain occasionally visible across a gutter, mild to moderate offsetting, plates with likewise mild to moderate foxing; vol. II plates with slightly darker spotting. A strong and attractive set of one of the significant early works on Maltese history. De algemeene en byzondere natuurlyke historie. Vierentwintigste en vijfentwintigste deel bevattende De vogelen. Twee delen in een band. TA., Schloß v. Südwesten, "Die Süd Westliche Ansicht des Heidelberger Schlosses. - Vue de la .". Real provision executoria de infanzonÃ­a en propiedad ganada por Don Pedro Ximenez de BagÃ¼es, y sus hijos DoÃ±a Valera, y Don Mariano Ximenez de BagÃ¼es: Don Francisco Gimenez de BagÃ¼es con sus hijos DoÃ±a Maria de los Remedios, DoÃ±a Maria de los Dolores, y Don Francisco Xavier Ximenez de BagÃ¼es, de Ximenez de BagÃ¼es, vecinos de esta ciudad de Zaragoza, y Don Josef Ximenez de BagÃ¼es, y sus hijos Don Pio, DoÃ±a Mariana, Don Mariano, DoÃ±a Severa, y DoÃ±a Lorenza Ximenez de BagÃ¼es de la ciudad de Huesca. 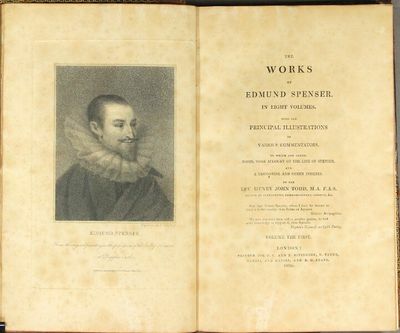 "The works of Edmund Spenser Ã‰ with the principle illustrations of various commentators. To which are added, notes, some account of the life of Spenser, and a glossarial and other indexes. By the Rev. Henry John Todd." London: F.C. and J. Rivington [et al.]. 1805. "8 volumes, large 8vo (ten inches tall - an old penciled note on the endpaper calls this a Large Paper copy), engraved frontis portrait in vol. 1, contemporary full polished paneled tan calf, neatly rebacked, black morocco labels on spine, a.e.g. ; edges a little worn, title-p. and frontis in vol. 1 browned, else very good and sound. Lowndes, p. 2477." Missale romanum, ex decreto sacrosancti concilii Tridentini restitutum S. Pii V. Pontif. Maximi jussu editum, Clementis VIII. et Urbani VIII. auctoritate recognitum; in quo missae novissimae sanctorum accurate sunt dispositae. CIENCIA DEL GIRO. Dedicada al Excelentísimo Señor Don Pedro Girón, Duque de Osuna, Conde Duque de Benavente. Chichester: J. Seagrave, for Richard Phillips, 1805. Small 8vo, (8), 212 pp. 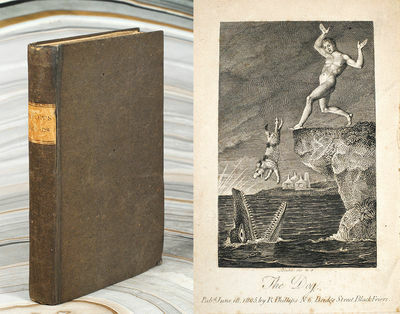 With 5 engraved plates by Blake after his own designs. Old drab gray boards, printed paper label, a very good copy. Ink signature on front free endpaper of Norman Davey dated 1913. Bookplate. First edition, with the first three plates in the first state. Bentley, Blake Books, 465. Easson and Essick, William Blake Book Illustrator, VIII. Bindman, Complete Graphic Works of Blake, 403-407. Paris: Vilquin, 1805. Stipple engraving, printed in colours and finished by hand by Ruotte. Very good condition apart from some overall light soiling and a few small losses along the edge of the bottom margin. An exquisite plate from arguably the most beautiful botanical work ever produced, Collection des Fleurs et des Fruits, "a work of outstanding importance and interest." Contemporary with the work of Redouté, Collection des Fleurs et des Fruits is one of the earliest examples of stipple engraved and colour-printed botanical illustration. Published in 12 cahiers (or parts) of 4 plates each, the work was compiled to assist designers of porcelain and fabric, with the plates often showing flowers grouped together, usually matched according to their flowering season. The greatest collection of flower books to be sold at auction in the 20th century was the de Belder collection, sold by Sotheby's in 1987. The catalogue was intended as a true reflection of the uniqueness of the collection, and the cover illustration selected to represent the best of the best was an image from Prevost's Collection des Fleurs et des Fruits . Dunthorne describes it as, "a work of outstanding importance and interest...issued for the specific purpose of maintaining the great French tradition for excellence of design and draughtsmanship. Perhaps no other prints are more worthy of carrying on the tradition of Jean Baptiste and van Spaendonck than these fine examples of Prévost. Whether bouquets or sprays of flowers or fruit, they possess a splendour and freshness amounting almost to fragrance, which is largely due to the quality of the colour printing." (Dunthorne, p. 33) Cf. Dunthorne p. 229; cf. Great Flower Books (1990), p. 127; cf. Nissen BBI 1568; cf. Pritzel 7332; cf. Stafleu & Cowan TL2 8319. NOVÍSIMA RECOPILACIÓN DE LAS LEYES DE ESPAÑA. Dividida en XII libros en que se reforma la Recopilación publicada por el señor Don Felipe II. en el año de 1567, reimpresa últimamente en el de 1775: Y se incorporan las pragmáticas, cédulas, decretos, órdenes y resoluciones Reales, y otras providencias no recopiladas, y expedidas hasta el de 1804. Mandada formar por el Señor Don Carlos IV. V tomos en 3 Volúmenes + Tomo VI. Contiene sus tres Índices Generales y el Suplemento correspondiente a los Años de 1805 y 1806. Essai sur nos colonies, et sur le rétablissement de Saint Domingue, ou considérations sur leur législation, administration ; commerce et agriculture. Philadelphia, 1805. Contemporary red roan, gilt, spine gilt extra. Extremities worn, boards lightly scuffed. Ownership inscriptions on front fly leaf. Light foxing and toning to text. Good. An early edition of the Episcopalian Book of Common Prayer, illustrated with engravings by Tanner after Robert Smirke. The Psalms follow the devotional text. SHAW & SHOEMAKER 9205. POTSDAM. "Gegend an der Havel bey Potsdam". Weiter Blick über Havellandschaft mit Potsdam im Mittelgrund, vorne ländliche Staffage. - Kupferstich von A. Zingg nach J. C. Reinhardt bei Tauchnitz, 1805, 22 x 32 cm. Thieme-Becker Bd. XXXVI, S. 521 - 523; Drescher/Kroll 680. - Der Schweizer Adrian Zingg (1734 - 1816) ist besonders durch seine sächsischen Ansichten und Landschaften berühmt geworden. Die Folge der "Havelgegenden bei Potsdam" nach Johann Christian Reinhardt erschien 1805 in Leipzig bei Tauchnitz. - Im sehr breiten Rand etwas stockfleckig, unten kleiner hinterlegter Einriß. Schöner Druck. HODSON, Thomas (of the Middle Temple) and DOUGALL, John (1760-1822). The Cabinet of the Arts; being a New and Universal Drawing Book forming A Complete System of Drawing, Painting, Etching, Engraving, Perspective, Projection & Surveying. Containing the Whole Theory and Practice of the Fine Arts in General, Illustrated. Prinz Heinrich von Preussen. Kritische Geschichte seiner Feldzüge. Von dem Verfasser des Geistes des neuern Kriegssystems. Zwei Theile in einem Band. 2 Kupfer, 1 Aquatinta und eine Karte. Berlin Himburgische Buchhandlung Erstausgabe 1805 - O-Halbledereinband mit Lederrückenschild und Aufdruck auf Deckel "Bibliothek des Regiments Prinz Johann", Einband berieben. Rücken, Ecken und Kanten beschabt. Deckel gering fleckig, Seiten sauber, Marmorpapiervorsätze. Erster Theil: 238 Seiten mit Frontispiz "Heinrich" gestochen von A. Graft und Fr. Bolt 1803. Titelblatt mit Stempel im Rand "Bibliothek des 2. K. S. Husarenregt.N.19". Zweiter Theil: Seite 239-436 mit Frontispiz (Pyramide im Wald) Aquatinta fec. A. Clar, Kupfertafel mit Obelisk L. Serrurier sculpt., sowie eine Faltkarte "Plan von der Schlacht bey Freiberg d: 29. Oct: 1762" C. C. Glassbach sen: sc:, 8°. Francois II. Empereur d`Allemagne et d`Autriche d`Hongrie et de Boheme. Gravé d`après l`Original de Joseph Hickel peintre de la Cour, que S.M. Empereur a anvoyé en 1802. Paris: Allais, 1805. First edition. Mottled calf, six compartments four decorated and bordered in gilt, one brown morocco lettering piece with title, and one red sp. 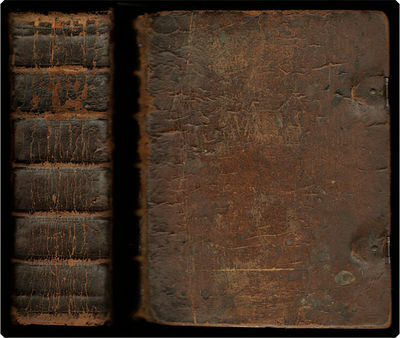 Boards rubbed, extremities worn, front joint partially split but holding firm, some leaves folded and partially soiled, endpapers offset, with the bookplate of the Military Order of the Loyal Legion of the United States, Commandery of the State of Illinois and waxed pencil accession numerals on front pastedown, shelf sticker on foot of backstrip, else contents very good.. , 299, , Plates. Illus. with 13 numbered folding plates + an additional 3 folding plates. The second volume only: De la Fortification Permanente ou des places. The first volume contained one part each on general accounts of war and field and temporary fortifications. From 1818 to 1830, O'Conner's translation of Vernon's work was the standard text at West Point and would have a profound impact on the Civil War. Freis, Cat. Lib. USMA, 73. Paris: Vilquin, 1805. Stipple engraving, printed in colours and finished by hand by Ruotte. Very good condition apart from some overall light soiling and a few minor foxing marks. An exquisite plate of a bouquet of various flowers from arguably the most beautiful botanical work ever produced: "a work of outstanding importance and interest." Contemporary with the work of Redouté, "Collection des Fleurs et des Fruits" is one of the earliest examples of stipple-engraved and colour-printed botanical illustration. Published in 12 cahiers (or parts) of four plates each, the work was compiled to assist designers of porcelain and fabric, with the plates often showing flowers grouped together, usually matched according to their flowering season. The greatest collection of flower books to be sold at auction in the 20th century was the de Belder collection, sold by Sotheby's in 1987. 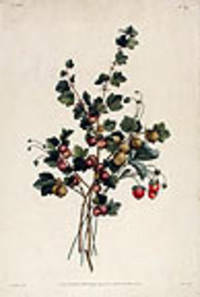 The catalogue was intended to reflect the uniqueness of the collection, and the cover illustration selected to represent the best of the best was an image from Prevost's "Collection des Fleurs et des Fruits." Dunthorne describes it as, "a work of outstanding importance and interest...issued for the specific purpose of maintaining the great French tradition for excellence of design and draughtsmanship. Perhaps no other prints are more worthy of carrying on the tradition of Jean Baptiste and van Spaendonck than these fine examples of Prévost. Whether bouquets or sprays of flowers or fruit, they possess a splendour and freshness amounting almost to fragrance, which is largely due to the quality of the colour printing" (Dunthorne, p. 33). Cf. Dunthorne p. 229; cf. Great Flower Books (1990), p. 127; cf. Nissen BBI 1568; cf. Pritzel 7332; cf. Stafleu & Cowan, TL2 , 8319. Försök till jordbrukets lönande behandling jemte bihang om sättet att afrappa trähus byggnader samt utan gips förfärdiga varaktiga tak i bonings rum. Strasbourg, F. G. Levrault, an xviii, 1805.. FIRST EDITIONS, 2 WORKS BOUND TOGETHER, 1805 & 1804, French text. 8vo, 200 x 120 mm, 8 x 4Â¾ inches, pages: xv, 127, bound in quarter calf over paper boards, gilt decoration and gilt lettered label to spine. Author's name from Bibliotheque Nationale. Boards spotted, corners slightly worn, 40 mm (1Â½ inch) split at foot of upper hinge with tiny chip to leather, tiny chip at head of spine, front inner paper hinge split, binding tight and firm. BOUND WITH the work analysed by Levasseur: REFLEXIONS CRITIQUES SUR L'ART MODERNE DE FORTIFIER, ou Motifs pour approprier, contre les moyens modernes de l'attaque, les avantages simples, faciles et toujours majeurs du sens vertical a grandes dimensions; ce qui, en resultat, (seconde et future partie du present ouvrage) reconduit l'art fortifiant a son premier et plus ancien trace, les enceintes en lignes droites sur chaque front et sans bastions ni ouvrages detaches; enceintes d'ailleurs tres-elevees, et qui doivent etre suffisamment epaisses, abritees, abritantes et communiquees. Dedie a l'amelioration continuelle de la chose publique. By HIPPOLYTE MORLET, ancien directeur des fortifications. Paris, an xiii, 1804. FIRST EDITION, folding frontispiece of fortifications, pages: 199, (12) - adverts, according to the last line of the text this is Part I only, but the copy in the Bibliotheque Nationale has the same number of pages and it seems this is all that was published. Both are good clean copies on military science, especially fortifications. MORE IMAGES ATTACHED TO THIS LISTING, ALL ZOOMABLE, FURTHER IMAGES ON REQUEST. POSTAGE AT COST.